This bad boy has been a long time coming... the epic Faedai Omni Icar Leviathan beast: Harma Bhatra. One of several delayed collaborations between myself and Karl Östlund (genocidalpenguin) this design is, in every way, a true collaboration of both of us even more so than the, now Vulne Pro Deviant gallery favorite, FOILjaeger 3aMF Gottheitzerstorer. 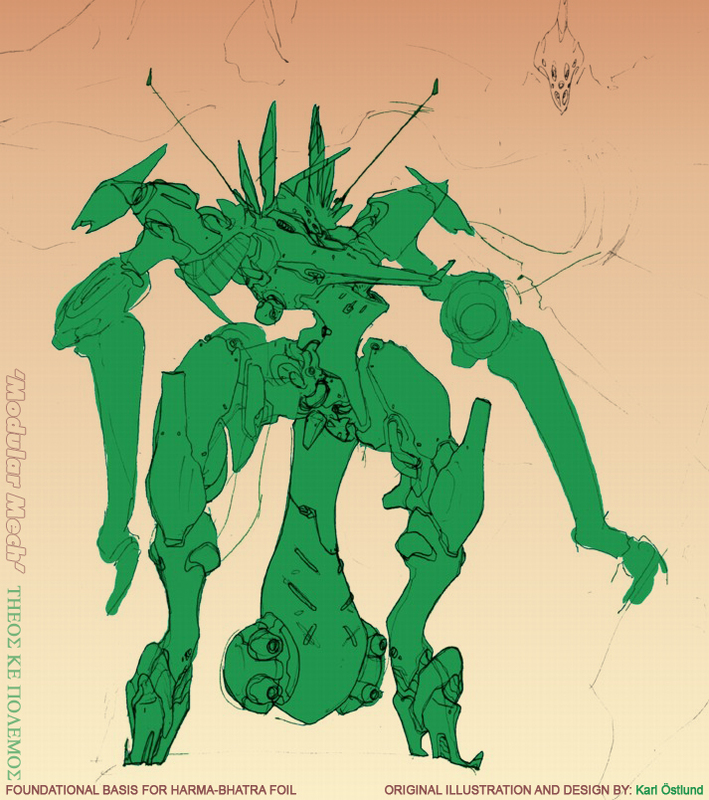 This new design is based on one of Karl's orphaned scrap designs simply titled 'modular mech' (also pictured below for comparison). I had always loved it's look, much like the design that became the Gottheitzerstorer, and during many of our conversations about the Theos material I suggested possibly doing something new with it in collaboration. Karl thought it was a cool idea and agreed so off I went with a notion of seeing what might come out of the exploration. Adding fin binders on the back, which are both thrust verniers and ECM/sensor equipment. Additional sensors, on both sides of the head, and one off the left shoulder armor plate. Right shoulder armor with dual barrel machine shettier. Strobe bombs (kinda like a flash bang for FOILs) attached. Mortar or smoke grenade, depending on load out, launcher on right shoulder. Long range heavy rail gun sniping rifle (as I progressed it hit me this thing needed an epic weapon). covered limb 4th gen arms and legs with much longer legs more akin to the FOILs typical design silhouettes while still maintaining Karl's original overall look. Some adjustments to the mechanical bits connecting the legs. New added armor plates in the center torso along with beefing it up a bit at the waist. Various other bits and bobbles and greebles. 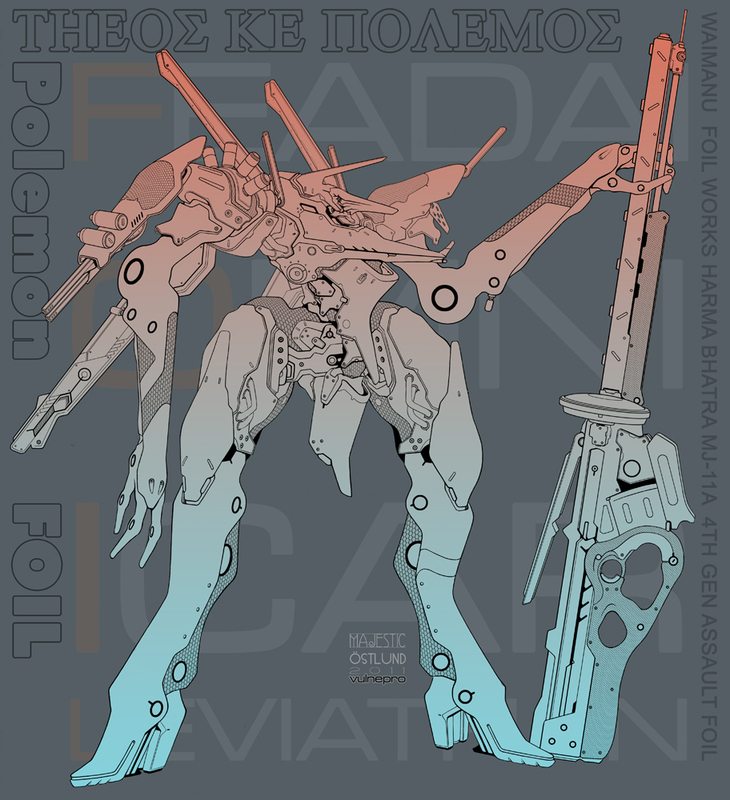 The Harma Bhatra MJ-11a was developed by the Waimanu FOIL Works, the company also responsible for the dreaded Gottheitzerstorer FOILjaeger's of the wildly experimental 3rd generation of FOIL development. There are some clear visual cues that nod back to the Gottheitzerstorer. 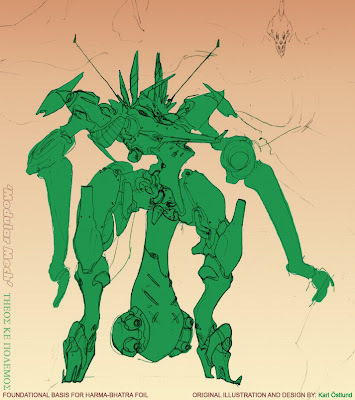 Though the Harma Bhatra is a very formidable Faedai combat frame it's nowhere near as massive as the Gottheitzerstorer was so the similarities have more to do with the manufacturer's distinct visual design cues than anything. Begining service toward the very end of the 4th gen period the Harma Bhatra might as well have been a 5th gen. Clear design cues point to what was to come in FOIL development; the covered limbs with equipment ports for customization, the appearance of enigmatic sensor equipment, the more streamlined aesthetics. The FOILs were changing before anyone, not in the know, knew why. Change was on the horizon as the sendai moved more, and more toward spiritual and political concerns, more freedoms. As such the Hindai movment (derived obviously from Hinduism in name and some core concepts but also having aspects of Buddhism and Taoism as well) spread and it's influence began to inform the naming conventions of the FOILs. awesome design, guys! loving these two! Thank you for the kind words Chris :) Yeah, been pretty busy taking care of him but I don't mind. I expect things to calm down a bit at some point so there will be piles more work to drop eventually.